The hospital social worker said this to me as we left the hospital the day after the accident. I still remember the look on her face, a mixture of disbelief and pride. Friends, family and church members had been flowing in and out of the hospital for the last 2 days. Before we even arrived at the hospital that horrible Saturday afternoon, members of our church had started to fill the ER waiting room. By the time we arrived, my parents and I had to be ushered past the waiting room through staff only doors so those who’d come to support us wouldn’t overwhelm us. Friends had completely filled the ER waiting area. Most were stopped there and not allowed on the ICU floor where we were taken. I never ventured into the waiting area to see the crowd. I was barely holding it together as it was, I couldn’t emotionally handle that. Though I never saw them, I appreciated their presence. Many other friends, who came to support us, came in through a different hospital entrance. They were able to make it to the ICU floor where my family and I waited for news of my husband. I can still remember looking in the waiting room and seeing them, sitting and talking to each other. I felt like I should go over there and join their conversation, but I just couldn’t. I stayed close to my family because I could not handle any conversation. I couldn’t talk to them, but I was so glad they were there. The group of friends who came to the hospital shifted throughout the day. Some came and went, others stayed for hours; new ones arrived as word of the accident spread. I appreciated their presence and the fact they didn’t intrude on my need for distance. The social worker who spent time with us during our 36 hours in the hospital watched the ever-shifting crowd of people who’d come to support us. Apparently, they made an impression on her prompting the comment as we prepared to leave the hospital that Sunday afternoon. Years later I understand why she was so impressed. I could not have made it this far without my support system. Going to graduate school to become a counselor I learned one of the most important factors for success in therapy is the individual’s support system. It’s not the relationship with the counselor or the therapeutic techniques used, it is the support system that makes the most difference. I can only imagine the hospital social worker saw the size of our support and knew we would be able to travel the hard road ahead. In truth, she saw only a fraction of those who’ve shown up to support me on my journey of grief. Through social media, my online photography club, and my rather large extended family I have been carried through my grief. 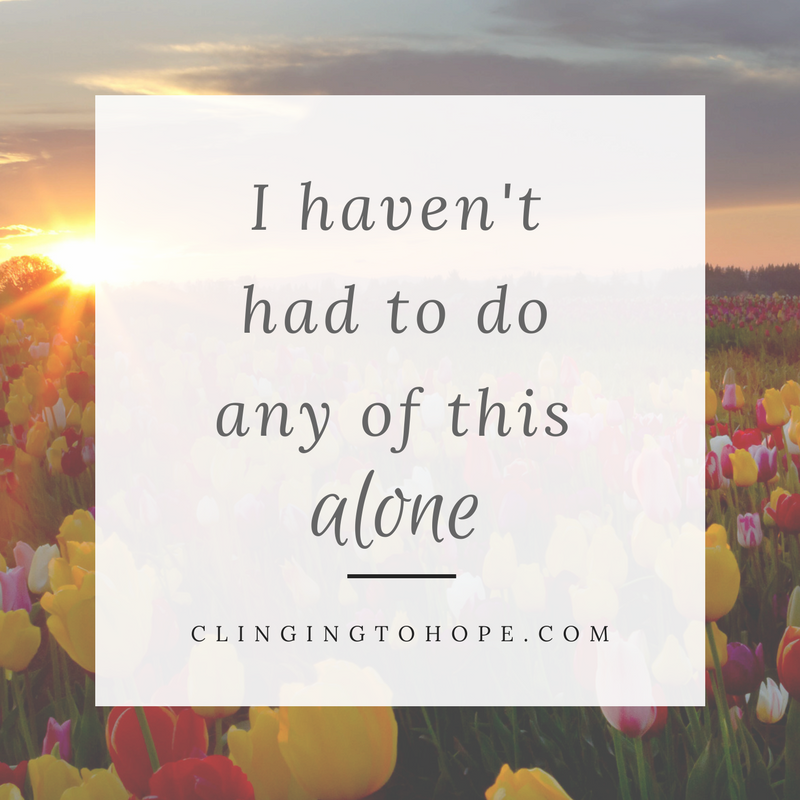 I haven’t had to do any of this alone. 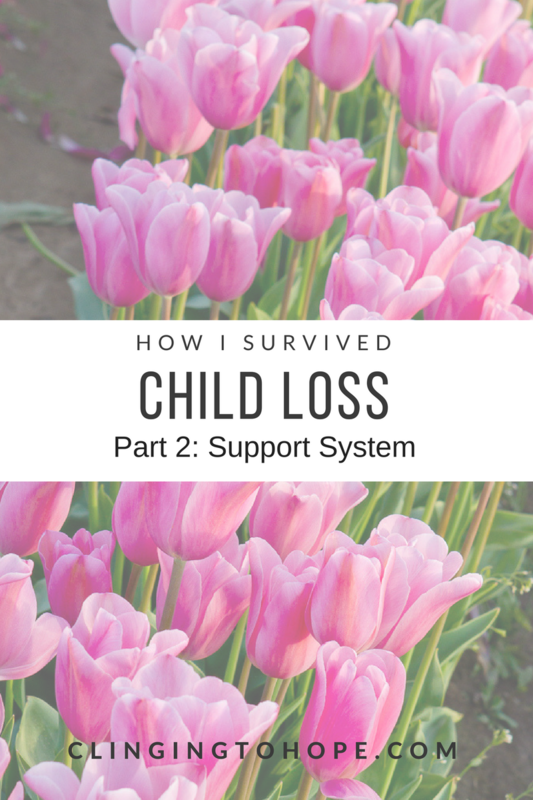 One night while working my new, I’m no longer a stay-at-home mom, job I had a meltdown. It was one of those bad grief days that I couldn’t contain. I was stuck in a call center customer service job and all I wanted was to go home and cry. But I had to keep answering phone calls. I made some big mistakes that night because I couldn’t focus. I was struggling to stay together so I could finish my shift. I posted on Facebook how bad my night was going. I watched the slowly moving clock, willing it to move faster so I could go home and break down properly. Finally, the time came for me log out of my computer and leave work. I walked out of the building and started heading to my car, only to discover my parents had come to pick me up from work. They had seen my Facebook post and had seen beyond the vague words and knew I was doing worse than I’d let on. My mom said to me “We weren’t sure if this would be ok”. It was a little weird, yes, but it was such an awesome thing for them to do. I curled up in the passenger seat of my van and cried as my mom drove me home, with dad following behind us. This is just one of the small ways my parents have supported me. I realized my sister and her family had given up all their holiday traditions to hide away with me. I felt bad about taking them away from their traditions until I mentioned it to my sister, she replied, “It’s the only thing you’ve asked us to do”. After all these years I still tear up at the selfless support. My extended family has been another layer of support. Both of my parents come from large families. Growing up I loved having so many uncles, aunts, and cousins. But I have never been so thankful to come from a large family as I have since the accident. As news of the accident spread my mom’s family descended upon us, flying in from all over the country. The chaos of the Greeley side of my family was exactly what I needed. They held me together that first week. My dad’s family is more quite, but their support as time has stretched on has sustained me too. I have such an amazing family. I could also go on about all the different ways my friends have shown me support. But this post is getting long. You can read about it (here, here and here). I don’t know why God has blessed me with such a wonderful support system. So many grieving parents are on this awful journey alone. I’ve heard horrible stories of the things other bereaved parents have had to endure from family, friends and even their church. It breaks my heart when I see how little support some people have. At the Compassionate Friends support group I attend, we have a saying “Your address book changes after the loss of a child”. It’s so true. People you thought would always be there for you disappear and others surprise you by becoming new friends. Even with my support system, I’ve had my address book change. People I thought were good friends are gone. And others I’ve had minimal contact with over the years became a larger part of my support. I would not have been able to walk this path alone. I need every single person who has supported me in any way they can. Each one of them has carried me on this journey. 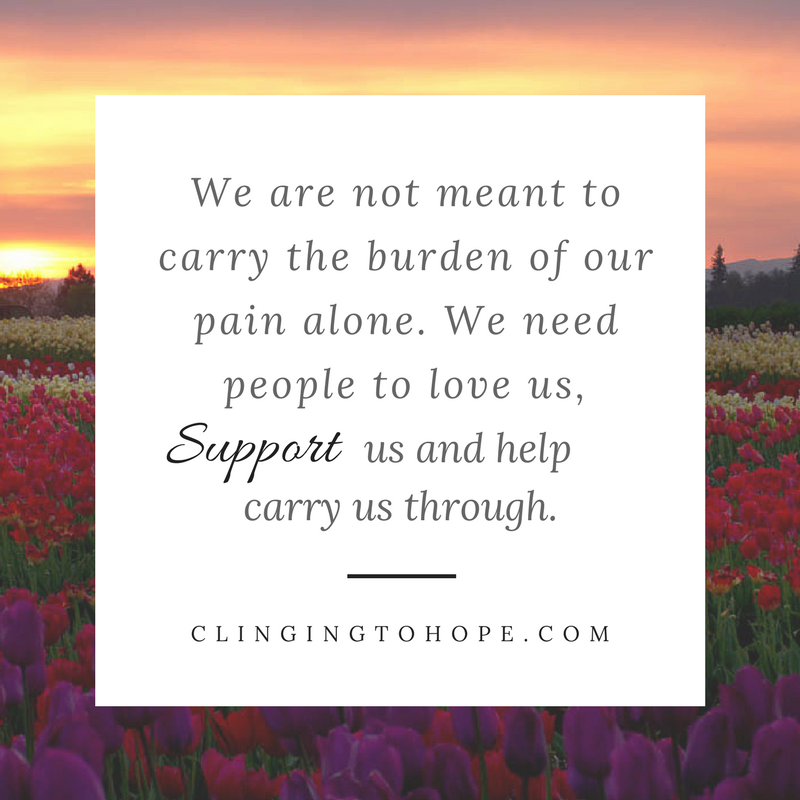 We are not meant to carry the burden of our pain alone. It’s too heavy and too hard. We need people to love us, support us and help carry us through. This concept is so beautifully demonstrated at the end of the Lord of the Rings trilogy. Frodo and Sam are trying to get to Mt. Doom so Frodo can destroy the ring of evil. No one but Frodo can carry the ring and at this point in the journey, the weight of the ring is too much for him. Frodo collapses and cannot go on. Sam, his trusted friend, in a climatic moment says to Frodo, “I can’t carry it for you, but I can carry you”. This is such a great demonstration of how we are to support one another. No one can ever carry or take away my pain, but I have been carried through the pain by the love and support of those God sent to comfort me. If you don’t have support in your grief journey look for a local chapter of Compassionate Friends or Grief Share. Such wise words and instruction for those who would ask, “What can I do”!